NNP News – Abuja, Nigeria – On December 31, 1983, Major-General Muhammedu Buhari overthrew the democratic government of President Shehu Shagari and declared himself Head of State. More than 35 years later, the retired Major-General has reenacted the feat to the displeasure of Nigerians and the international community. 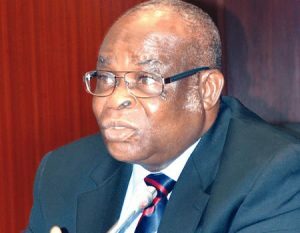 This is why Nigerians, including the Senate President Saraki and PDP opposition presidential candidate, Atiku Abubakar, and the legal community all across the country are up in arms at the coup orchestrated by Buhari in suspending the Chief Justice of the federation, Justice Walter Onnoghen. Many have called it a complete affront on democracy and the principle of equality among the three branches of government. The chief justice, currently standing trial for holding foreign accounts and incomplete declaration of assets, was suspended by the president and replaced with the most senior justice on the court, Justice Ibrahim Tanko Mohammed. President Buhari who once described himself as the “law and order” president, went well beyond his powers as prescribed in the 1999 constitution in suspending the chief justice. The constitution states two ways the chief justice can be removed from office – if the chief justice is guilty of a crime or by a 2/3 vote by the senate. None of the above has occurred and there is no provision in the constitution for the chief justice to be suspended. With this flagrant violation of the nation’s constitution, many are calling on the president to reinstate Justice Onnoghen and to resign and be prosecuted for violating the constitution he swear to protect. The Nigerian Bar Association has disavowed of this action and calling on Nigerians n0t to recognized Justice Mohammed. This sudden action by the president under the pretext of false assert declaration by the chief justice is motivated by the fact that election petitions would be decided by the chief justice, a southern Christian who was in the process of constituting a tribunal to resolve petitions in the forthcoming general elections. President Buhari and the cabal that controls the lever of power have concluded that a southern Christian might not protect their interest in the event the election results are disputed due to irregularities that have always marred elections in Nigeria. With a northern Muslim at the helm, Buhari and the cabal are rest assured that their interest is protected, and if they rig the elections, justice will be perverted by the stooge they have installed in office. Nigerians of all political, religious and ethnic stripes must rally behind truth and justice and defeat this tyranny of President Buhari.